everyone, but if you’ve got the right kind of taste, they’re really quite remarkable. Bradley. Very simple traditional arrangements of classic Irish tunes. to be incredibly dull – downright trite. 4. **Gentle Giant, “A Reunion”**: Progressive rock with strong madrigal influences. real depth and sophistication. Beautiful track. Fripp’s tape loops setting the structure of the track; Belew doing his crooning voice. through a lens of modern jazz and some rock. There’s some Ornette Coleman and Some Robert Fripp in here, mixed with the klez. Highly recommended. is absolutely typical of their sound. If you don’t know, you should check it out. They’re strange, harsh, loud, and very, very good. more classically inspired vein of PR; Dirty Three is always wonderful. This entry was posted in Music on June 29, 2007 by markcc. Graph coloring is deceptively simple. The idea of coloring a graph is very straightforward, and it seems as if it should be relatively straightforward to find a coloring. It turns out to not be – in fact, it’s extremely difficult. A simple algorithm for graph coloring is easy to describe, but potentially extremely expensive to run. This entry was posted in Graph Theory on June 28, 2007 by markcc. So that 8-facts thing is going around, and I got tagged. I’ve stalled long enough that everyone I read was already tagged, and I’m sure you’ve all seen it by now, so I’m not going to waste time repeating the rules or tagging anyone else. of grad school and opening a restaurant. four years working with her, and I still think she’s amazing. Best advisor ever! problems that that’s caused me is the total inability to read maps, or catch balls. a bluegrass banjo, and 2 Irish tenor banjos. that I could teach to do math. doorstep the next morning, and pretty much never left. This entry was posted in Chatter on June 28, 2007 by markcc. In light of [my recent demolition of a purported improvement on the second law of thermodynamics][2l], an alert reader sent me [a link to this really boneheaded piece of work at Uncommon Descent by Granville Sewell][sewell]. arguments that came about because people don’t understand the second law of thermodynamics. It’s their confusion of 2LOT, *not* any flaw in Sewell’s argument. This entry was posted in Intelligent Design on June 27, 2007 by markcc. Get out your crayons: it's graph coloring time! One kind of graph problem that’s extremely widely used in computer science is called graph coloring. There’s two versions of it, *vertex coloring*, and *face coloring*. Vertex coloring is the one that’s more widely used. Edge coloring problems are all variations on the following: given a graph *G=(V,E)*, find a mapping of colors to vertices, such than if two vertices are adjacent, they’re assigned different colors? that can be used to color a graph? * Given an integer N, can you find an N-coloring of the graph? The face coloring problem is more complicated to describe. Suppose you have a *planar* graph. (Remember that that means a graph which can be drawn on a plane with no edges crossing.) Suppose further that the graph has the property that from any vertex v, there is a path through the graph from v to v. Then that graph is called a *map*. For a map drawn on a plane, every edge is part of at least one cycle. The smallest possible cycles – that is, the cycles which are not bisected by any other edges of the graph – are called *countries* or *faces* of the graph. The face coloring problem assigns colors to the *faces* of a graph, so that no two faces that share an edge are the same color. There’s an extremely fascinating proof that any planar map can be face-colored with no more than four colors. We’ll talk about later – it’s the first computer assisted proof that I’m aware of. This entry was posted in Graph Theory on June 26, 2007 by markcc. Via The Art of Problem-Solving, a great video on Mobius transformations. I never really got how the inversion transformation fit in with the others before seeing this! This entry was posted in Topology on June 25, 2007 by markcc. Let’s talk a bit about graphs, being a tad more formal about them. This entry was posted in Graph Theory on June 25, 2007 by markcc. Set theory is, alas, going to need to take a break. I left my books on the train on friday. $200 worth of textbooks down the tubes, unless one of the conductors happened to hang on to them. At least I’ve got a pre-order already placed for a copy of the new addition of Ferreirós book; between that, and a new copy of Quine, I should be OK. But in the meantime, we’ll look at something else. Since I mentioned graph theory on friday, and I’ve been promising forever to write about it, I figured this is a good time. My favorite introduction to graph theory is stolen from one of my grad school professors. It’s the first major use of what became graph theory, which is a proof by Euler. take a trip through the city of Königsberg, crossing each bridge exactly once? More generally, given a city like Königsberg, how can you figure out whether it’s possible to tour the city crossing each bridge exactly once? 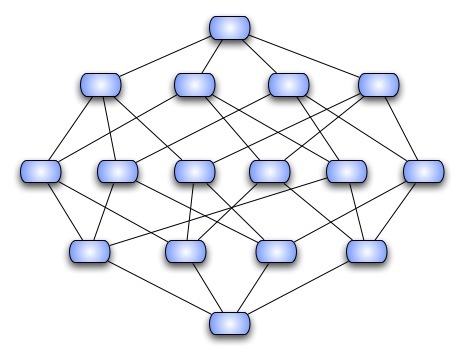 This entry was posted in Graph Theory on June 24, 2007 by markcc. PZ Has a Question: Is George Gilder Wrong About Network Theory? PZ wrote about the latest nonsense from IDiot George Gilder. In this interview, Gilder tries to make some really horrible arguments about how everything is really hierarchical, and he uses “information theory, computer science, and network theory” as examples. I believe that the universe is hierarchical, with creation at the top – the idea that there’s a creator and that we, at our best, act in his image. This top-down model is what all of my work has in common. I sensed that the basic flaw and failure of feminism was its gradient toward pure animal passion with no procreative purpose. In economics, I believed that it was the supply that created the demand. In my examination of computers and telecom, and subsequently biology, I saw the same thing. That’s really how I came into the intelligent design movement – through the recognition of this same structure that I’d previously examined in sexuality and economics, information theory, computer science and network theory. Computer science and network theory: Gilder knows nothing about either, and has no training in the subjects. I suspect there are readers who know far more about the subject than Gilder: is network theory all about setting up strict hierarchies of top-down control? And hey golly, that’s right smack dab in my area. of my favorite areas of computer science. And the short answer to PZs question is: “Hell no: in fact, if that *were* the case, it wouldn’t be an interesting subject at all. What makes it so interesting and difficult is precisely the fact that things aren’t hierarchical”. This entry was posted in Intelligent Design on June 22, 2007 by markcc. Sorry for the missed weeks of friday pathological programming language columns. To be honest, I’m running out of languages. I’m sure there must be more, but my usual sources (dealers?) are running out – so send links! trivially simple as [BrainFuck][bf], but which ends up looking almost as much like line-noise as [TECO][teco]. It’s called [Betterave][betterave]. This entry was posted in pathological programming on June 22, 2007 by markcc.